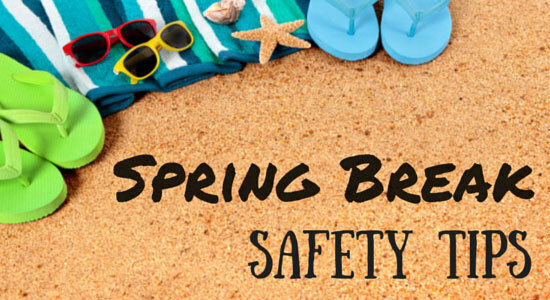 Spring Break is supposed to be time for college students to relax and recharge. Not all college students choose rowdy escapes. More and more campuses are promoting alternative spring break activities such as drug-and alcohol-free parties and sporting events and “service” vacations. That being said, parents and family members should be aware of the risks and temptations college students face when vacationing with their peers. According to a University of Wisconsin study, 75 percent of college males and 43.6 percent of females reported being intoxicated on a daily basis during spring break. Nearly half of the males and more than 40 percent of the females also reported being drunk to the point of vomiting or passing out at least once during break. This kind of binge drinking is the major culprit in alcohol poisoning. It also increases the risk of car accidents and arrests for such violations as drunk driving, public intoxication and property destruction. Decide in advance what and how much you will drink. Plan how you will refuse once you reach your limit. Use a designated driver or choose public transportation. Drinking makes it easier for a person to become either the victim or the perpetrator of a sexual assault. Be aware of your consumption! Don’t allow yourself to be taken to an isolated location. Use the buddy system. Don’t walk alone. Attend large parties with friends and plan to leave with the same friends. Don’t leave a drink unattended. Don’t accept open drinks from strangers. If you start feeling odd, put the buddy system into action. Don’t flash cash; limit visits to ATM machines. Look through the peephole before answering the door. Don’t open it for a stranger. If someone claims to be hotel staff, call the front desk for verification. Never agree to meet someone who has “found” your lost/stolen purse or wallet: Notify police. Mexico and some Caribbean islands are popular spring break destinations. When traveling abroad, students should remember that foreign nations have different laws and customs and that drug trafficking can mean long prison sentences. Contact the country’s consular office or visit the State Department’s Bureau of Consular Affairs Web site. Check the country’s entry and exit requirements. Take extra copies of travel documents (driver’s license, passport, birth certificate). Review State Department travel warnings, which detail crime and health risks. According to the American Society of Travel Agents and the College Parents of America, charter flight delays, hotel over-bookings and non-delivery of services are common problems. Be skeptical about solicitations that sound too good to be true. Research the travel company and don’t give out credit card numbers until you’re sure the business is reputable. Receive complete details in writing about any trip prior to payment.